The last few weeks have been a busy time for the Pelagios team. In parallel to kicking off our work on linking gazetteers as part of first Infrastructure Workpackage (IWP 1), we also started to assemble some foundational bits and pieces of our second IWP - which is concerned with building up the data and annotation infrastructure. Jump cut to Vicarello, Italy, mid-19th century: excavations at the Aquae Apollinares Baths in 1852 reveal three cylindrical vessels made of silver, with heights varying between 95-153 mm. Excavations in 1863 later reveal a fourth vessel of similar kind. 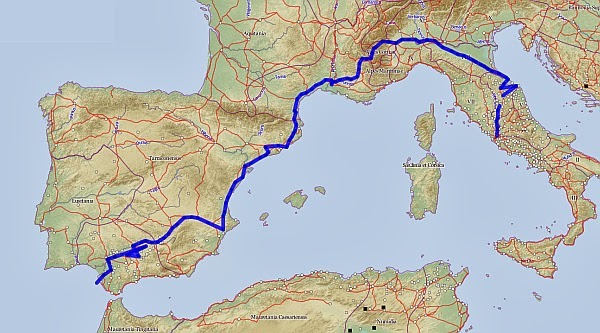 Although differing in the details, on the surface of each vessel is engraved the Itinerarium Gaditanum, the land route between Gades (Cadiz) and Rome, listing between 104 and 110 road stations along the way, and the distances between them in units of Millia Passum (thousand Roman steps or 1481 meters approx). 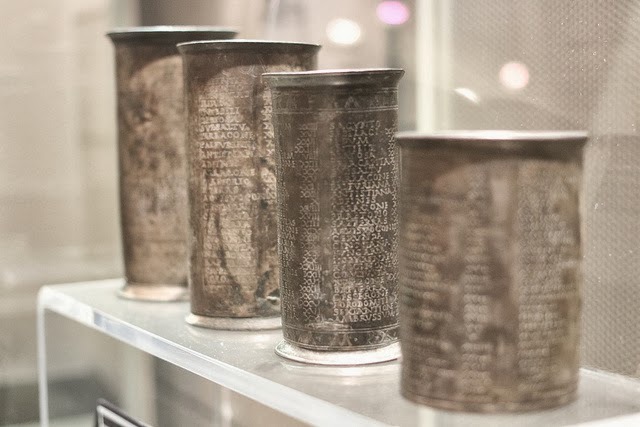 The Vicarello Beakers, as they are now frequently referred to, have traditionally been identified as miniature replicas of a milestone probably erected in Gades, perhaps similar in design to the Miliarium Aureum (the Golden Milestone) in Rome. Originally, through the study of the different stations of the route, experts had dated them at different times between the governments of Augustus and Tiberius. But recent palaeographic studies and comparisons with late documents such as the Antonine Itinerary or Burdigalensis Itinerarium, as well as their resemblance to the missorium of Theodosius suggest a dating to the late third or early fourth century AD. Their handy number of toponyms, as well as the fact that there are images and transcriptions available online already, makes the Vicarello Beakers an excellent test case to teach our data infrastructure a few new tricks. Technical details about the upgrades it's about to receive (complete with RDF samples and pointy brackets) will appear on our Wiki and through our mailing list in due course. But, for the purpose of this blog post, let me just give you a sneak preview of some of the things our upgraded data model can do. Linked Data, Open Annotation, RDF, What? You may recall that Pelagios is based on the principles of Linked Open Data, and that we have chosen the Open Annotation Data Model as the conceptual basis for our common vocabulary. These foundations will not change. But with a growing network of partners, more diverse content, and increasing amounts of data, it has become painfully clear that our initial data model from the days of Pelagios 1 and 2 has reached its limits. We have grown to so many partners and content now that data for major places has become practically unmanageable - just try to find something useful in our data about Rome! So what are the things our new data model will improve? First and foremost, our new model allows for richer item metadata. There is now a much cleaner separation between information about the item, and information about the places that relate to it (and how). There is room to encode dates and temporal characterics, categories, authorship, languages used in the source document - ordering dimensions which help us to get more structure into the pile of "anonymous place references" we agglomerated through our first two project phases. In line with a richer metadata model, we have also adopted the FRBR distintion of Work and Expression. In FRBR terminology, the Vicarello Beakers are a Work - "a distinct intellectual or artistic creation". Each of the four beakers is termed an Expression of this Work. This is another straightforward ordering principle, which helps us to get more structure and hierarchy into our data. One of the changes that happend in the transition between the (now deprecated) Open Annotation Collaboration model and the new Open Annotation model is support for multiple "annotation bodies". I'll refer to the OA spec for details. But as far as Pelagios is concerned, this change allows us to represent the different "faces" of a place reference in a source document - logical mappings to (a) gazetteer URI(s), its precise transcription, different images of it, etc. in a much simpler way. Toponyms in a document may follow a certain sequence or layout. The Vicarello Beakers are a prime example of this: laying out their toponyms in a list with four columns, according to the sequence of the places along the route between Gades and Rome. We're experimenting with ways to record the logical ordering of toponyms in a document, and bringing it to use for visualization. This simple mashup shows the toponyms from the four Vicarello Beakers on a map. There's an information box with the Work metadata at the bottom, and if you look to the top-right, you will find a small layer menu which lets you switch places - and the path indicating the toponym sequence - on and off individually for each beaker. Click on a place, and a popup will show you the transcription from the Beakers, along with the gazetteer reference from Pleiades, which corresponds to the place. What's noteworthy about this demo, however, is not so much the map itself - but rather that the map is generated completely automatically from a Pelagios RDF file, containing item metadata and OA annotations. (You can grab the RDF source file here.) In essence, these are also our first baby steps towards the Visualization Workbench - which is the objective of our third infrastructure workpackage. In the meantime, stay tuned for the exciting sequel to "Pelagios and the Beakers of Vicarello" - in which the Pelagios team will tackle their next Early Geospatial Document, and where we will shed some light on the workflow we use to compile our data, and how we transform it to Open Annotations.